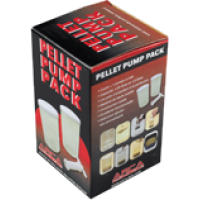 The Arca pellet pump is easy to use and offers many opportunities to present your bait that little bit extra. 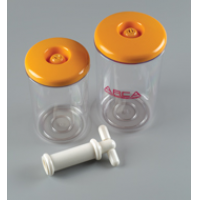 Initially a pellet pump serves to make "expander" pellets. For example, you take Bait-Tech Special "G" Green pellets. Fill the pot up to a third with pellets. Then fill the pot with water until it is filled about two-thirds of the pot. Fitting of the cover on the pot, and with the pump pull a vacuum. 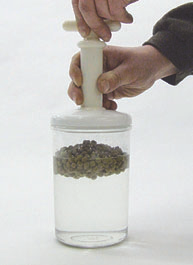 The pellets absorb the water, become soft and will sink. 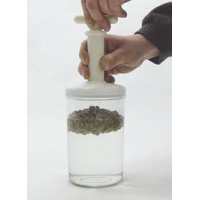 On the water you can add a water soluble flavor or sweetener in order to give the pellet own character. You can do this with just about all types of pellets. 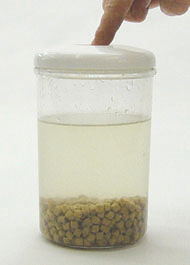 Fill the pot with pellets and water. 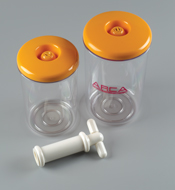 Vacuum draw with the pump. By pressing the valve air comes back into the pot and you can open it.